First, congrats to the Bama coaches and players on a great victory. This was especially sweet after last years game. It seemed that Bama made the better half time adjustments. OFFFENSE: Bama had a total of 500 yards of total offense. This included 377 passing yards and 123 rushing yards. Most of Bama’s yards came after halftime as Bama had only 186 yards in the first half, which means they had 314 in the second half. As for negative plays, Bama 2 tackles for losses and 1 sack. Bama had 4 three and outs with 2 in each half. 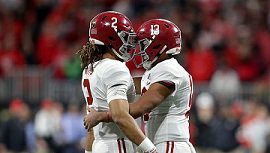 For plays that covered 10+ yards, Bama had 15 passing plays, 7 in the first half and 8 in the second half and 4 running plays, 2 in each half. Bama got into the red zone 3 times and scored 2 touchdowns and 1 field goal. They scored 5 touchdowns from outside the red zone. A few additional notes are Bama had 5 touchdown drives in the second half and they equated to 5 (75 yds), 4 (69 yds), 3 (75 yds), 4 (43 yds) and 1 (53 yds). They had 7 drives in the second half and scored 5 touchdowns. QB: Tua had very good game, especially in the second half. He completed 78% of his passes and averaged 12.96 yards per reception. He did miss a couple of throws and I think he missed and open rec on one play. Jalen was 100% pass completion and averaged 53 yards per reception. I know they were running the clock the 2nd series he was in and didn’t throw the ball. RB: The running backs combined for 94 rushing yards on 21 carries which breaks down to 4.47 yards per carry. Most of the yards came on tough runs since they rarely had a wide-open hole to run thru. Rec: Not counting running backs, 5 different receivers had multiple catches. Jeudy had 5 for 77 yards and a touchdown. Waddle had 3 catches for 73 yards and 1 touchdown. D Smith had 4 catches for 72 yards and 1 touchdown. Ruggs had 5 catches for 62 yards and 2 touchdowns. They did a good job blocking for others after they caught the ball. OL: I believe they played well, but they couldn’t get to the second level of the defense most of the game. The reason, I think they played well is there were only 3 negative plays for the offense. I do wonder why Bama didn’t run the edge more because 2 of their biggest runs came on runs on the edge. Def: The defense played well. They gave up a total of 283 yards, which included 153 passing and 130 rushing. AU averages 3.02 yards per rush. As for negative plays, they had 2 tackles for losses, 4 sacks, and 1 interception. The drive after the interception led to a touchdown. Bama had 4 three and outs with 2 in each half. For plays that covered 10+ yards, Bama gave up 4 passing plays and no running plays. AU got into the red zone once and scored a touchdown. The other two touchdowns came from outside the red zone. A few more observations. First, AU receivers had 5 drops, most early in the game, which keep them from getting early momentum. Second, they had at least 3 trick plays one which worked. One the double pass, I think there should have been coaches yelling from the sideline about the depth of the receiver giving an idea that there could be a double pass coming. The players also should have recognized the receiver was deeper than normal. I know this had to be seen on film study because they said that was his second touchdown pass this year. Third, on one of the three and outs Bama was fortunate the QB didn’t see the defender slip down and leave a wide-open receiver for a first down and much more. Finally, Bama only rushed 4 more that 9 times, if my calculations are correct. DL: This was a good game for the DL. I thought Ray, Davis, and Jennings had good games. They handled the front with 4 most of the time which as usual freed the LB’s to make plays. LB: They played well. With all the, as they call it, eye candy they must really concentrate on their reads and make the plays. DB: They played well. There was one big touchdown given up but, it was an underthrown ball the defender lost sight of. When playing a lot of man to man coverage, this is going to happen sometimes. I thought Carter played well. It is going to be interesting what Bama is going to do the first half of the next game, since Mayden will miss that half. Special Teams: The big knock on the special teams was the blocked punt. They caught Bama blocking down and brought and overload from that side. The other punts were fine and even pinned AU inside the 15 once. I thought Bulovas had his best game on field goals and extra points. The ball seemed to get up quickly and on target. So that means his alignment was good also. When AU decided to return kickoffs, they only made it pass the 25 to the 27 once. Penalties: Bama had 8 penalties for 82 yards. I didn’t see what happened on the first personal foul called on Jacobs. The second was on the coaches for substitution infraction. The third was a false start when the Tua was changing the play. Tua was called for intentional grounding which could have been avoided if he had thrown it out of the back of the end zone. The face mask by Williams was unlucky as the QB lowered his head when he saw Williams coming to him. A targeting call and roughing the passer gave them 30 yards on one drive. Another couple of notes, I don’t know why Gussy was complaining about the holding call as it could have been called on two different players. Also, I didn’t see any coach really getting on the player for the cheap shot on Waddle on the punt play. Finally, this game was huge. Bragging rights for a year and I understand Bama got a couple of commitments after the game. This next week will be a big test as UG is playing well at this time. "Also, I didn’t see any coach really getting on the player for the cheap shot on Waddle on the punt play." That was the most reckless or flagrant infraction I've seen lately on a punt returner. If they throw players out for bumping helmet to helmet, this infraction should include disqualification too. Too me some coach should have been livid since the punt wasn't to far and it gave Bama even better field position. Thanks, Coach. Good stuff. Auburn week is now complete! And the replay from behind Waddle clearly showed the offender's eyes fixed on Waddle. I haven't watched the replay yet, but I thought at least one coach did talk with the offender after the hit. I'll watch it tomorrow. He talked to him, but it didn't seem like an a** chewing. Maybe asss chewing frightens the goats. Scared he would fall over and play dead? Yeah, that long completion from the underthrown ball, was the result of a pushoff that wasn't called. Overall, I was very pleased with the play. A little worried about our secondary going into the Georgia game. Fromm has really improved since the LSU game, and we will need to put pressure on him. Thanks hscoach as always the year is well rounded with wins and especially your posts. RTR!